The Royal Ballet demonstrate duets in school dinner halls and encourage children to join in. During September, the Royal Opera House Education team went on the road to deliver ballet demonstrations as part of the Chance to Dance programme. This is now being followed up by workshops and finally a chance to dance at the Royal Opera House. 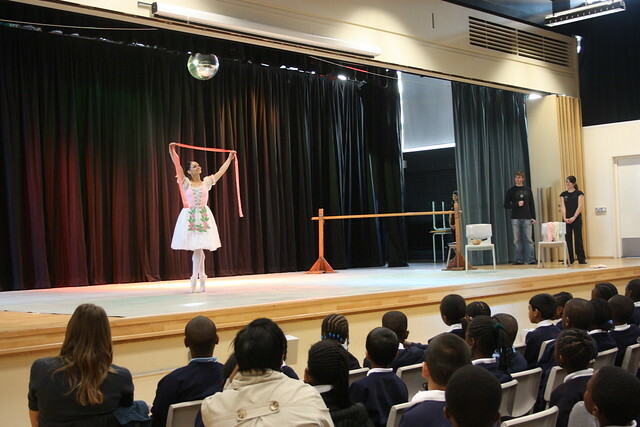 The scheme brought ballet to 900 Year 3 students from 20 primary schools in Lambeth and Southwark. Children were wowed by Royal Ballet dancers and members of the Orchestra who presented scenes from La fille mal gardeé. All of the children are now taking part in six creative dance workshops run by dance practitioners. On top of this, those children who show an aptitude for dance will be invited to become part of the Chance to Dance Company. Not only will they be able to take part in free weekly dance lessons for up to four years, but they will also be able to take part in an annual performance alongside dancers from the Royal Ballet. The children without exception loved the performance - it is such a magical thing to see enraptured faces of children - your demonstration session managed to transfix so many of our SEN [Special Educational Needs]children - wondrous! The class were almost universally inspired...for them to see two first soloists in that setting was an amazing experience. One of the boys who got up to dance as one of Lise and Colas's friends was obviously having a little ballet epiphany as, when he had previously looked at pictures of ballet dancers or watched the YouTube clip of La fille mal gardeé, he had been especially giggly. Not so after the Royal Opera House's exciting demonstration however! He was doing the mime for dance in an unfamiliar school hall while Ricardo and Yuhui danced around him on point. Well done for running such a fabulous scheme. For more information about opportunities for young people visit Chance to Dance. What a wonderful scheme! This seems like exactly the sort of thing needed in schools, to inspire young children and encourage them to experiment with something potentially completely new. And who knows, one or more of those children may well grow up to grace the ROH stage! Wonderful scheme! We now have a daughter in full-time vocational training at White Lodge as a consequence of the hard work and dedication of the teachers! She hadn't danced before the scheme visited her school 3 years ago.